SKU: AV120-3-1 Category: Staging Tag: Images on this website are for reference only and actual item may look different. Available for delivery and installation by our staff only. Customer Responsibility is to make sure that it will fit elevators and doorways, additional extended labor will incur in additional fees and it includes stairs and long distances (over 30′ from our truck). 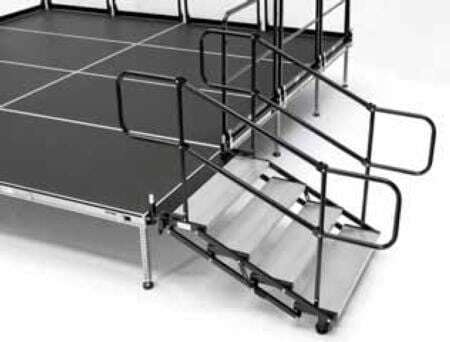 Platform high could be 1 or 2′ high without additional charge then if you desire 3, 4 or 5 ft higher IT is available but contact us for a quotation or to place your order. Questions, call us 510.244.7921 help@goodevents.com. We deliver BIL-JAX staging products.